For a 360-degree photograph of the interior of the Chapel, click here. 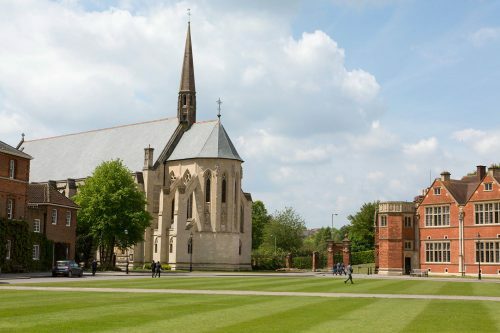 The venue for the main conference programme, St Michael and All Angels Chapel, at Marlborough College is a masterpiece of Victorian vision and purpose. 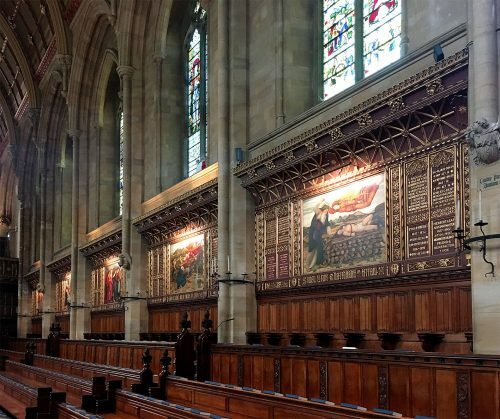 Its interior is considered to be one of the finest decorative schemes in nineteenth century church architecture, and includes a series of twelve large biblical murals by the late Pre-Raphaelite John Roddam Spencer Stanhope. These depict scenes involving angels, six on the north side from the Old Testament and a like number on the south from the New. Two other artistic features are the Scholars’ Window on the south side, which was designed by Edward Burne-Jones and made by Old Marlburian William Morris, and an external sculpture ‘The Virgin and Child’ by Eric Gill above the west door. Also of interest architecturally are the apsidal form of the East end and the strikingly large reredos in the Anglo-Catholic style, which was gilded much later, in 1951, by Sir Ninian Comper at the same time as he painted the inside of the apse. 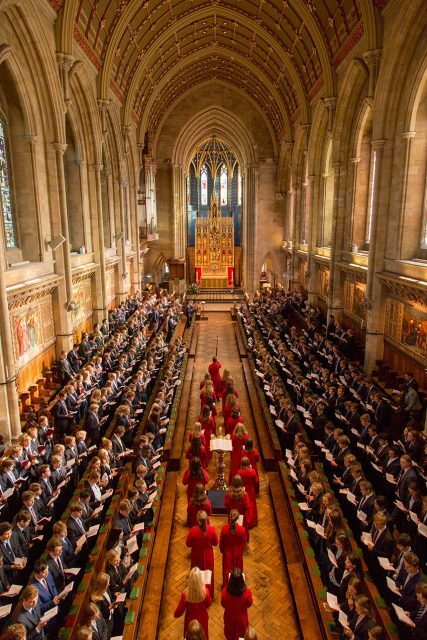 Marlborough College, now a co-educational independent school, was founded in 1843 with the prime purpose of educating the sons of clergy. The first Chapel, designed by Edward Blore (1787-1879), was opened in 1848 to accommodate 500 boys. It was, however, a rather plain building and by 1880 the College community had, in any case, grown to over 600. An initial scheme of enlargement by lengthening the walls and raising their height had to be abandoned when it was discovered that Blore’s foundations were insufficiently strong to bear the extra weight and the decision was taken to salvage everything possible before Blore’s Chapel was completely demolished in 1884. The new Chapel, designed in the Late Decorated Gothic style by George Frederick Bodley and Thomas Garner, was dedicated to St Michael and All Angels and was consecrated in 1886. Its colour scheme of greens and browns was much loved by Sir John Betjeman, another former pupil at the school for whom the memories of his time there formed a memorable part of his blank verse autobiography Summoned by Bells (1960). Over the course of 2016/2017, recordings of the Sunday Chapel services were made and can be found by clicking on the title above. These recordings are ‘as live’ and unedited, sung by teenagers on a Sunday morning; they are not presented as concerts, but as warts-and-all slices of Marlborough College’s worship. Listeners are able to experience something of what it is like to be with the College community in Chapel on a Sunday morning.